For the past 7 years, my extended family has converged on a cozy clubhouse that sits on the tip-top northern point of Lake Tahoe. For those non-Californians reading, Lake Tahoe is the weekend playground of San Francisco Bay Area residents. The ~3 hour drive towards the Nevada border brings you to mountains and skiing and hiking and lakes and beaches and gorgeous weather and gambling and restaurants and AFFLUENCE. A tiny condo sitting lake-side runs an easy $1.5 million these days. When my cousins Kathy, Stacey and I originally thought this up we had various optional activities planned for each day from Friday through Sunday including hiking, golfing, visiting the swimming pool, beach-going, shopping, etc. But the vacation has morphed to be very much "come and go and do as you want". Really, the only true thing we all do together is all-you-can-eat sushi at a local jaunt on Thursday night, feasting at the clubhouse Friday and Saturday nights and usually a trip to a Reno buffet on Sunday. That's right - my family prioritizes food as VERY high!! My family is lucky enough to have 3 Tahoe vacation-home owners which makes gathering 35+ folks together for a long weekend, a very affordable vacation. My parents have owned this home since I was 7; Ah the memories..
After eating together each night we basically spend the hours between dinner and bedtime - playing games. 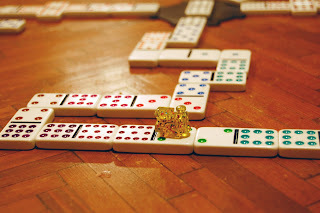 It's usually card games but board games make an appearance too. 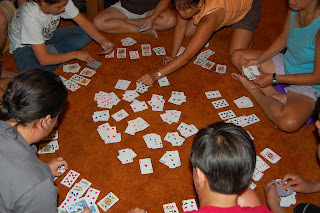 Poker, mah jong, dominoes, bridge, a game we call H-E (for H-E-double-toothpick) which is multiple player solitaire usually come out multiple times over the 3 days. Really the best part of this trip is that our enormous family gets to spend some extensive time together - more than you get over dinner at Thanksgiving. My mother is #11 of 12 kids, so our family from grandparents down consists of just over 100 people to keep track of. It's weekends like this that really make it possible!